Eight cabins are well spaced along a half mile of lake shore, providing privacy, peace, and quiet. There is a choice of completely modern carpeted or semi-modern natural log cabins. All cabins are directly on the lake with screened porches and private docks. No. 8 cabin is on an Island with road access. All cabins are furnished for light housekeeping, everything provided except towels. Enjoy the many trails for hiking, the wildflowers and especially our state flower, the pink Lady slipper. Three day minimum Memorial & Labor Day. #1, #2, #3, and #4 are fully modern. The others are semi-modern. A minimum deposit of $250 is required for each weekly reservation and $150 for shorter periods. We will hold your reservation 7 days to allow your deposit to reach us. If you must cancel, your deposit will be refunded (less $15 office fee) when the space is filled. We allow well behaved pets, but make a charge of $10 per day, $50 per week for each pet! 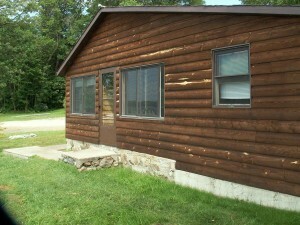 All cabins are on the lake front and have a fine view of the lake! A 14 foot Alumacraft boat is included with each cabin rental. Extra boats may be rented at $10 per day, $50 per week. All cabins have their own private dock which will accommodate two boats. There is no charge for cabin guests bringing their own boats. Guests have free use of canoes, paddle boats, and kayaks at the beach area. Weekly rentals are Saturday to Saturday. First time guests are expected to finalize payment upon arrival. If campers bring their own boat- $3 per day for use of the boat landing area. Campground is away from the cabins. The entire campground is well shaded. Guests have free use of canoes and two kayaks at the beach area. When you arrive we request that you register at the office- also, if there are more people in your party than originally planned for, please inform us. Electricity $1.50 No air conditioners.